June 19, 2015 – To make the process of managing and issuing repeat patient prescriptions faster and easier for Irish pharmacies which meet local ethical codes of practice, Kodak Alaris announces today that McLernon Computers is installing KODAK SCANMATE i1150 Scanners as part of a retail pharmacy software solution sold to chemists in both the north and south of the country. Retail dispensing is a complex area. In the Republic of Ireland (RoI) alone, 13 different drug payment schemes are on offer with 1,800 pharmacies in the country prescribing an estimated 80 million items each year. To manage this requires installing a feature-rich IT system and McLernon Computers has won considerable market share with its modular MPS retail pharmacy dispensing software now installed in over 50% of pharmacies in the republic – around 950 sites – and 450 chemists in the north. MPS is a WINDOWS-based IT system used to manage the whole dispensing process end-to-end including recording drug information in patients’ files, printing labels, managing stock, checking drug interactions, and claiming money back from either the Irish Health Service Executive or the NHS in the UK. Of the 80 million prescribed items in the RoI, around 50 million now go through MPS. 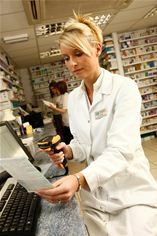 Each time repeat prescriptions are made, pharmacists have to physically check back to view the original prescription to see what medicines the patient was taking. This is required to meet standards as outlined by the Irish regulator, The Pharmaceutical Society of Ireland (PSI). Having thoroughly reviewed the market, McLernon Computers decided to partner with Kodak Alaris as its scanner hardware vendor, selecting KODAK SCANMATE i1150 desktop scanners as the optimal device for use given their small size, speed and ability to scan in duplex as both sides of prescriptions have to be captured. KODAK SCANMATE i1150 scanners are specifically designed for use in customer facing situations where staff need to quickly and efficiently scan documents as part of a business process so as to reduce waiting times and enhance customer satisfaction. Recognising that the majority of customer transactions involve scanning 10 or less documents, the KODAK SCANMATE i1150 features a special ‘transaction mode’ which boosts the scanner’s performance by 60% for the first 10 pages – equating to 40 pages per minutes [ppm] – before it resumes its normal processing mode of 25 ppm. This avoids the scanner becoming a bottleneck and ensures more customers can be seen. The i1150 has a recommended daily volume of 3,00o pages and scans in black and white, grayscale and colour. To date, around 400 pharmacists have deployed KODAK Scanners with McLernon Computers predicting that, within 18 months, the large majority of its customer base will have shifted to scanning prescriptions as well as storing other medical related documentation such as letters from consultants or general practitioners.